"As a report by a panel commissioned by Mayor Rahm Emanuel of Chicago found on Wednesday, racism in the city’s Police Department is rampant: Blacks are disproportionately subjected to traffic stops, Tasers and street stops that do not lead to arrest; they also account for an appalling 74 percent of the 404 people shot by the Chicago police between 2008 and 2015." 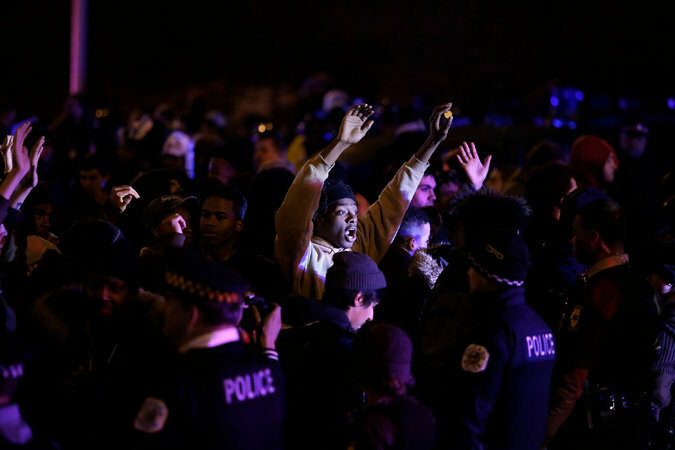 Demonstrators protested after the Chicago Police Department released a video showing the killing of Laquan McDonald last November. “The rottenness is not confined to the Police Department. Racist practices extend far into the criminal courts, indeed they are the very foundation of the cases that enter into the court system. • Blacks are disproportionately subjected to traffic stops, Tasers and street stops that do not lead to arrest; they also account for an appalling 74 percent of the 404 people shot by the Chicago police between 2008 and 2015. • What the report does not say, though — and what many Chicagoans may not know — is that the rottenness is not confined to the Police Department. Racist practices extend far into the criminal courts, indeed they are the very foundation of the cases that enter into the court system. • The hands of many judges and prosecutors are just as dirty as the bigots in blue. • I know this firsthand. In 1997, I became a court clerk in the prosecutor’s office for Cook County, which encompasses Chicago. Many of my days started with my supervisors’ corralling police officers who were scheduled to testify. • The officers, in plain clothes, would walk into the office with a rolled-up newspaper under one arm, as if they were walking into a men’s bathroom rather than an office. • Often, they would sit in the jury box, next to the judge (regardless of the appearance of impropriety) and would dutifully teach me how the justice system really worked. • “How black men really were “dogs,” and how judges and prosecutors who focused on due process “nonsense” were “liberals” who were throwing away “their” cases. "What I realized was that attorneys were nearly as well versed in the Chicago Police Department’s brand of street justice as they were in the criminal code. And they knew that to blow the whistle or in any way resist this culture could cost you your reputation, your job or, even, your safety. "A judge I often worked with gave me my first lesson in criminal law, Cook County-style. He didn’t refer to the criminal code or even the Constitution. He taught me the Chicago Police Department’s brand of case acquisition. He said to watch for a string of cases where officers would reproduce the same police report detailing how drugs would “fall out” of defendants’ pockets as they “fled on foot” — common phrases used by police officers. The judge said that a “certain” neighborhood (which was code for black and Latino) had an epidemic of “holey” pockets. "The judge laughed at the fabrication of police reports as if it were a novelty, rather than an abuse of power. Never once did the judge try to teach me about the Fourth Amendment and whether such police practices fell within the boundaries of lawful search and seizure." •PLEASE READ the complete Op-Ed in the NY Times linked here. In a post written on 4/14/16 titled: "MOST OF AMERICA’S SOCIAL INFRASTRUCTURE IS BUILT ON RACISM"
We wrote: No one should be surprised that the Task Force that investigated the Chicago Police Dept. found that it is also “Plagued by Systemic Racism.” That’s true of most police departments in USA. Some are less brazen. “The report, issued on Wednesday, was blistering, blunt and backed up by devastating statistics. Coincidentally, it was released as city leaders were installing a new, permanent superintendent for the Chicago Police Department. (This calls for more than a little skepticism). Will anything, beyond superficial measures, be done to effectively address the problems found as well as those that exist at every level? It’s time for the US Justice Dept to take strong and permanent measures on police depts. across the country, starting in Chicago. Rahm Immanuel should resign. When Rahm Immanuel took over as Mayor of Chicago, he knew those problems existed. What has he done to address them? When black people react to the constant barrage of racist behaviors hurled against them, the ‘system’ either condemn the behaviors of blacks, or it takes a few steps to hide the racist behaviors and policies a little more deeply. There are no systemic changes that will eliminate and prevent the behaviors going forward. There is not much that a black police chief can do to really make fundamental changes unless the very foundation of the system is changed.